Ready To Unlock Your German Shepherd's ﻿﻿﻿﻿TRUE﻿﻿﻿﻿ Potential? 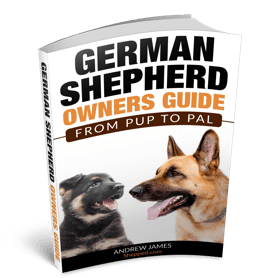 Introducing the German Shepherd Owners Guide; From Pup To Pal. Your insider's guide to unlocking the REAL power inside of your German Shepherd using 100-year-old breed genetics. You come home with an amazing new puppy, and they automatically take to you as their pack leader. Listening to every command you give, not getting sick, having just enough energy for you to keep them occupied, but not so much that they want to run wild in your house. What if you could use your German Shepherd’s natural instincts in your favor, though? The same instincts that made the original GSD breeders choose the bloodline for use in the military, as protection animals, and as herding dogs around the farm? With the German Shepherd Owners Guide, you can. Inside of the guide, you’ll understand how German Shepherds evolved from their humble beginnings into the elegant, loyal, protective, and trustworthy dogs the military, farmers, breeders, and competition handlers grew to love. What would life be like if you could tell the difference between a breeder out for their own profits, and one that was actually involved in the proper selection of the bloodlines they choose to continue breeding? What if you knew that your German Shepherd puppy was never going to get sick, or develop the illnesses and diseases that GSDs are known for having when they come from irreputable breeders? What if you could adapt your new puppy or adopted dog into your pack, and have them automatically take to you as their pack leader, without constantly testing you for the role? How would you feel if you knew you were feeding your puppy a perfectly balanced diet, knowing that they were getting the exact nutrients they needed, without causing the potential behavior and health problems associated with a poor diet? Would you agree that a well-trained dog that knows their place in the pack is the perfect life companion? Inside of the German Shepherd Owners Guide, you’ll get the answers to all of these questions along with…. I’m Andrew, the founder of Shepped.com, and your author, guide, and impromptu trainer that’s going to help you along the way. Since I was young, I’ve had a growing curiosity for German Shepherds, and my love for the breed has never waned. As time went on, I realized that I was in a unique position to help both new owners and owners that had already learned the joys of the German Shepherd breed get more out of the time they spent with their dog and help them become a treasured member of their families. That’s why I founded Shepped.com, and what drives me to continue helping people every day, every chance I get. As you’re reading through this guide, make sure to slow down and take notes. There’s a lot of information contained in these pages that will help you understand more about your German Shepherd, how to make sure you’re picking a dog that isn’t going to have health problems, how to spot potential health problems if they come up, how to properly train your puppy so they understand that you’re the leader of “the pack”, and how to make sure you’re going to have a pal for life. Prefer To Listen, Instead Of Read? Not a problem. Along with the 100-page e-Book, you can instantly download, you’ll also get access to the complete audio version to take with you wherever you go -- in the car, on your phone, or while you’re working around the house. The German Shepherd Owners Guide saved me from considering giving her back, and thinking that I was in over my head by getting a German Shepherd puppy. “I was stumped before I bought the German Shepherd Owner’s Guide. My puppy wouldn’t listen to me, and kept chewing things up around the house. She even destroyed an extension cord. I was worried to death when I finally decided I needed to do something about it. Trainers were too expensive for my budget, so I turned to Shepped.com. I’m glad I did because I understand how to train her now, and how important it is to be her pack leader. For both my sanity, and hers. After 2 weeks of working with him, he’s back to the happy, energetic dog that I found at the shelter that day! 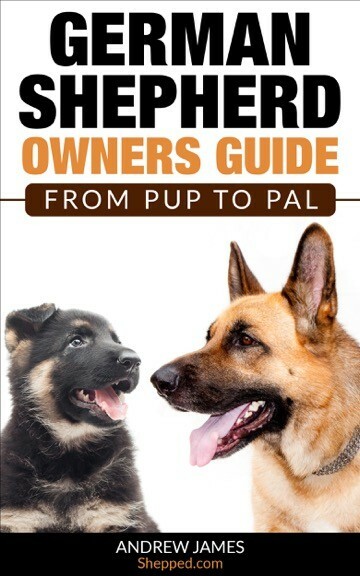 “The German Shepherd Owners Guide was great! I’m glad that I found it. I adopted a German Shepherd from my local shelter and thought I was doing a good deed saving his life. When we got home I realized that he wasn’t the same dog that I saw at the shelter. He was energetic and happy at the shelter but became shy and timid when we got home. I didn’t know what to do. I tried helping him warm up to me and my home, but nothing seemed to work. I jumped online and started searching for ways to help him adapt when I found the German Shepherd Owners Guide. After downloading it, I started working with him using the techniques they gave me, and he started to come around. After 2 weeks of working with him, he’s back to the happy, energetic dog that I found at the shelter that day!" She seems to actually look forward to me giving her commands, now. “My puppy wouldn’t listen to me. I tried doing everything I could to teach her new commands, but she was too stubborn and it seemed like she was almost determined not to listen to me. I slowed down my approach and used the training techniques inside of the German Shepherd Owner’s Guide and something in her seemed to click. I think once I understood why she was acting the way she was, and what she needed to see from me, she automatically took to me being her “pack leader” as Andrew calls it. For that, I’m glad I found the guide, downloaded it, and implemented what they taught me. She seems to actually look forward to me giving her commands, now." Pouring through countless emails, and answering an endless stream of questions, we’ve taken everything you guys are looking for and wrapped them up into an easy-to-digest manual. 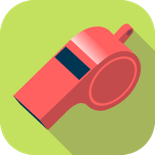 We even went one step further and created an audio version to help you get the most out of the information. 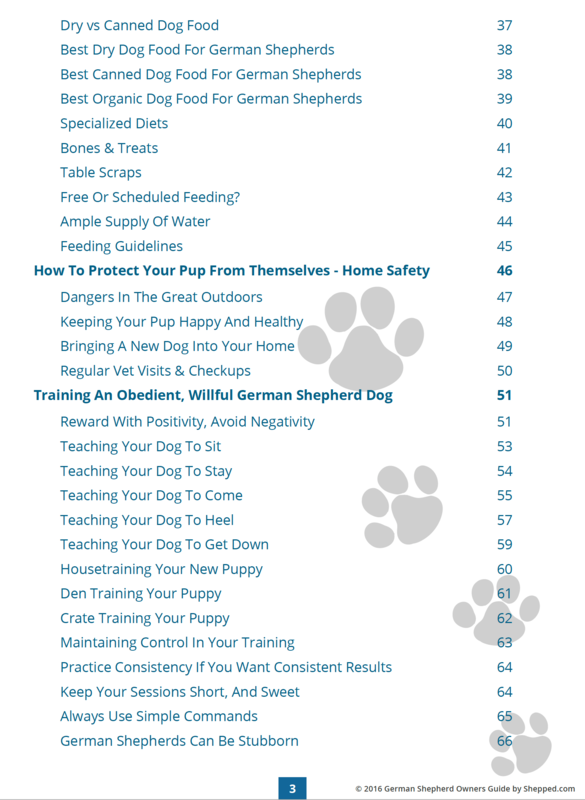 If you’re a professional trainer, have years of dog nutrition education, or have generations of dog breeding in your history, there may be a few morsels you can pick up in the guide, but, for the most part, this guide may not be for you. If you want to help your German Shepherd develop into the trustworthy, protective, loyal, smart, and obedient dogs their instincts want them to be, the German Shepherd Owners Guide; From Pup, To Pal is written specifically with you in mind. Get Risk-Free Instant Access To The Handbook and Audiobook version Today! And, if at any time during the first 60 days, you feel that you’re not happy with your purchase. No problem. Just send us an email, and we’ll refund 100% of your money. No questions asked, no hard feelings. On top of the 100-page handbook, and the extensive audiobook, you’ll also get access to a handful of bonuses created to help you become a better owner…. The 5 Step Quick Start Training Guide that will have you acting like a professional trainer in 15 to 20 minutes a day. The Adoption Health Checklist that will let you spot potential health and behavior issues before they become major problems after the adoption process. A list of reputable breeders to help you find the perfect bloodline without having to worry about GSD specific illnesses and diseases down the road. The New Puppy Checklist to help you properly acclimate your puppy to your home, keep them safe, and help them thrive in a new environment. 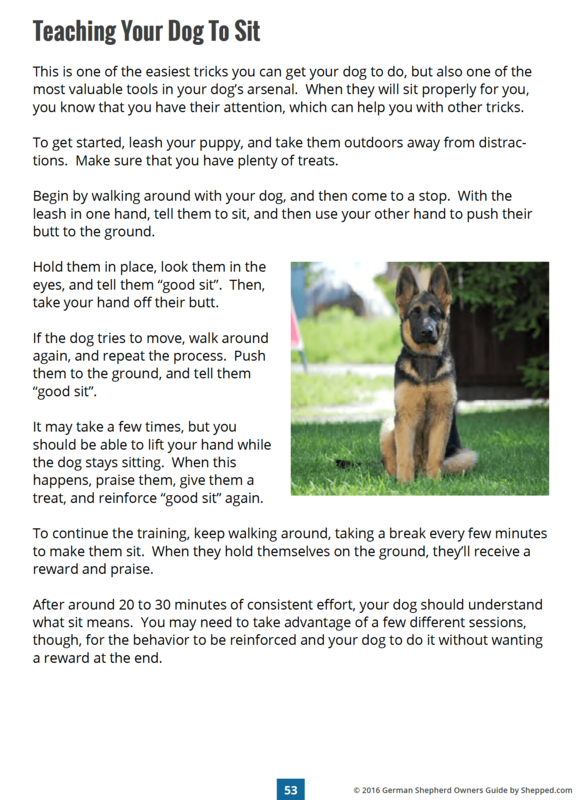 The German Shepherd Owners Guide (and bonuses) will be updated and revised in the future, and when it is you will get instant access to the new edition at no extra cost! I understand that your book is an e-Book and Audiobook available exclusively via digital download (I just click and save it to my computer once my order is processed). I can print it out if I want to and put it in a binder for easy reference. 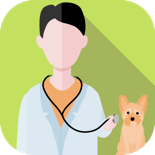 I also understand that I get access to all 5 incredible bonuses, including "5 Step Quick Training Guide", "Adoption Health Checklist", "List Of Reputable Breeders", "New Puppy Checklist", "German Shepherd Owner's Quiz" AND future revisions and updates absolutely FREE! For a fraction of what it's really worth and what it cost me to research, you could be reading it in a matter of minutes. 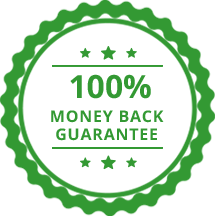 We offer you a complete, money-back, no questions asked refund policy. So just go ahead, download the e-Book today, read it and apply your new-found skills with your German Shepherd for a full 60 days. If you aren't absolutely thrilled with it for any reason (or for no reason at all) just let me know and I'll issue you a cheerful refund with no questions asked. This is the perfect opportunity for you to bond with your German Shepherd, become the confident owner and pack leader you know is waiting inside of you, and help your GSD develop into the loyal, trustworthy, obedient companion that they’ve been known for, for over 100 years. ClickBank is the retailer of products on this site. CLICKBANK® is a registered trademarkof Click Sales, Inc., a Delaware corporation located at 917 S. Lusk Street, Suite 200,Boise Idaho, 83706, USA and used by permission. ClickBank's role as retailer does notconstitute an endorsement, approval or review of these products or any claim, statement oropinion used in promotion of these products.